What Makes a PPC Campaign Successful for Small Businesses? It’s not measured in pure clicks. It’s not measured in how little you spend on a click. We can’t even measure it solely by conversions. PPC campaign success comes down to one all-important metric. What’s your PPC ROI? Turning clicks into conversions is what truly matters. To grow your business it all comes down to this question. What’s it cost to acquire new customers vs. how much is that customer is worth? How much money will they usually generate once they have converted to a customer? What kind of ROI do you need to see from your PPC campaigns? 5X, 10X, 15X? Let’s explore how to attain it. To have a successful PPC campaign, you must choose the right keywords to target. These aren’t just any keywords that relate to your business. They’re strategic and designed to maximize your PPC ROI. Build a seed list — These are words off the top of your head. They’re also based on knowledge of your customers, previous campaigns, and competitors. Use research tools to expand this list, or eliminate words — Tools will include keyword planners as well as tools that help you understand what the competition is using. Refining your list — Don’t skip this crucial step. It will cost you. A great PPC campaign and SEO keyword is actually a phrase composed of 3-6 words. If you just use a single word, the competition would typically be so high that you wouldn’t be able to get a decent ROI. In the digital marketing world, we call these phrases long-tail keywords. But they’ve become the norm, replacing single words for many years now. A great keyword gets decent traffic without being too competitive. A great PPC campaign keyword isn’t just any phrase that has to do with your business. It has regard for what your goals are and where the customers who will see your ad are in the buyer’s journey. Let’s look at 8 categories that you can put keywords into as you align keywords the buyer’s journey and our goals. These are very broad keywords. They are helpful especially in the awareness phase. They may be just what you need if you’re a new kind of company. Do you have a new product line that people aren’t specifically searching for? Or are you trying to reach newbies who may not know what they’re looking for? These keywords do the job. These broad keywords should be used and monitored very carefully to avoid sabotaging your campaign. If they aren’t performing well, it’s time to get rid of them. If you specialize in organic steel-cut oatmeal, then a very broad audience-based keyword might include “healthy foods” or “breakfast ideas”. You would use alternate keywords when people tend to gravitate toward a very similar product. People who search for “quick oats” or even “cream of wheat” could be persuaded to try your oatmeal with the right message. If your ad appears when people are looking for your competitor, the right message could encourage them to switch. These might include a brand name or a specific branded product name. What do you actually sell? Here’s where you get more specific with terms like “steel-cut oatmeal” or “organic oatmeal”. Here’s a great example of a high intention AdWords search ad. To avoid a competitor stealing someone who looked up your brand specifically, you can use keywords that include your brand. These are keywords that indicate that someone is not your target customer. They may add these words to a keyword you’re targeting when they type a query into Google search. Because they included this word, you know that you’re not really what they’re looking for. For example, a person who searches for “digital marketing” is looking for something very different than someone who types “digital marketing jobs”. In this case, unless it’s a recruitment ad, it’s in everyone’s best interest that the ad not even appear. It would risk a click you’ll have to pay for that you won’t convert into the customer you want. Plus, it makes your ad appear irrelevant to AdWords. When you add negative keywords, you reduce the chances that someone will accidentally click on your ad, thinking it’s something else. As you start your campaign, you’ll find more negative keywords to add to your list. Keeping your ad from appearing where it shouldn’t is just as important as having it appear where it should. Don’t ignore them if you want to have a successful PPC campaign. To begin your list, consider each of these categories and how they align with your campaign goals. Which keyword category or categories make the most sense for your campaign? Which keywords are customers using to find your company or companies like it? Explore common customer social media hangouts, blogs, and forums to find out. Create a list for this campaign. You may find that you have some go-to terms that you use across campaigns. But keep in mind that your goals can change the keywords you choose significantly. Now it’s time to expand the list. Even if you’re an expert in the industry, you need to know what terms people are actually using to find products or services like yours. Even if your ads aren’t in AdWords, start with a tool like AdWords Keyword Planner unless the platform has a better tool for you. Or invest in a paid tool. You may find it very worth it. Sort by each category to find the best keywords based upon the criteria we discussed. As tempted as you might be to focus on the cost per click, remember the big picture is ROI. As a general rule, people are paying more per click because they have a higher ROI. This may not be the case in all businesses. So you’ll use analytics. Make sure you’re never paying more than that click is actually worth to your business to guarantee a positive ROI for your campaign. You can waste a lot of time trying to re-create the wheel. If your competitor already did the work for you, why not see what they’ve got. Paid tools like Spyfu and SEMRush allow you to spy on the competition. These tools can be cost prohibitive for small businesses who are handling marketing alone. But a digital marketing company is able to spread the cost of these tools across many clients, making them cost-effective. You can also do competitor research manually by searching for each keyword on your list to see who pops up in the ads. You then have an idea about who you’re competing with. You can take a closer look at their sites and strategies. You’ll both refine your list before and during the campaign. Before, you’ll want to get rid of words that are just too competitive or don’t get any traffic. As you begin to refine your list, you may determine that some terms will be more effective in a different campaign. Avoid doing all of this work over and over. Start categories for lists of words you rule out. They may be useful somewhere else. Watch your campaign closely once it’s running. If you have words that perform poorly, weed them out. Or move them to a different ad group. When you know what a customer is worth, you know how much you can spend to acquire that customer. You’ll also be able to better calculate your PPC campaign ROI. People often use complex formulas to figure a customer’s lifetime value (CLV). These formulas may be more accurate. But they typically result in businesses throwing their hands up and just guessing what a customer is worth. Here’s the quick and easy way to determine a customer’s value. If you don’t know your CLV, start here. Then refine your estimate later if needed. What’s the average spend per purchase? How many years will the average customer be a customer? If you’re a kid’s clothing company or similarly time-restricted business, this last one may be clear. If it isn’t, you can also look at this on a yearly or 5-year basis. Are you a new business? Start tracking these numbers now to learn what each customer is worth to your company. CLV isn’t just one number across your whole company. Some customers are worth more than others. But you don’t have to look at each customer individually. That would be way too cumbersome. You’ll find that some segments have a higher value than others. When you’re creating your PPC budget, you can spend more to acquire those customers. Let’s look at your budget next. Some small businesses jump right into PPC without a budget. They inevitably overspend. They don’t realize that what they are doing really isn’t working. They fail to plan for related expenses. Because they didn’t plan, they turn to the lowest bidder for the unplanned stuff in an effort to keep from breaking the bank after the PPC campaign is in full-swing. Ad copy — You’ll either DIY, pay someone in-house or hire a 3rd party. If you’re creating display ads, you’ll also need a designer using one of the options mentioned. Landing page — The most effective PPC campaigns have landing pages that seamlessly align with the ads. Someone needs to write and design them. Cost for clicks — You can set a limit in your campaigns, making this the easiest budget item to calculate. Other labor — You may be paying someone to research, manage and/or monitor your campaigns. Someone’s got to do it. PPC advertising isn’t a “set it and forget it” type of marketing. It requires continuous monitoring and optimization. UX Optimization — You can’t run an effective PPC campaign if you don’t have a flawless user experience on your website. If you’ve already invested in a responsive website and SEO to create the optimal user experience, skip this. Tools — Many tools are free. You’ll also find some paid tools that make planning, running and analyzing your campaigns easier. To determine the actual cost of your campaign, you’ll divide up all of these expenses by the number of new customers you generate. In most cases, we’re talking pennies per each. But to know your real ROI, it’s important to factor in all of related marketing expenses. Whether you’re creating social media PPC ads or using AdWords, geo-location is a vital component of your ad strategy. It doesn’t matter if you have a Shopify shop or you’re a local business. There will always be locations that are more ideal than others. Do you think everyone is a potential customer for your ecommerce shop? Consider if that’s true to get the best ROI. Australia, New Zealand, India or Wales? An ad in English might display there, but are these good locations for your ad to display? 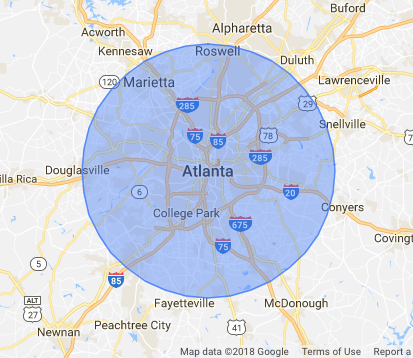 If you’re a local business in Atlanta, are people in Nashville, Ashville or Ft. Lauderdale very likely to become your customers? Probably not. Failing to geo-locate can cause 3 serious problems for your campaign. You’ll get more accidental clicks. People don’t realize your location before they click. You’ve just wasted their time and the cost of that click by not setting up your ads properly. They immediately leave your site. This makes the ad platform think that you either have a poor user experience or the ad was irrelevant. If you’re using AdWords, they’ll start penalizing your campaign if this keeps happening. Your cost per click will go up and you’ll become less visible against your competitors. In a Facebook or Instagram PPC campaign, you can even target people who are visiting in your area. Each platform will walk you through it step-by-step. Does your ad point to your home page? You’re making a mistake far too many small businesses make. Your home page is a general page that tells people about your company. Companies that create multiple landing pages aligned with their ads generate 12X the leads. And yet 44% of companies point their ads at their homepage. 61% have fewer than 5 landing pages. A landing page is a page that is specifically designed to meet a goal. It is built to directly align with your ad. If the ad is speaking to plumbers, the landing page also speaks to plumbers. 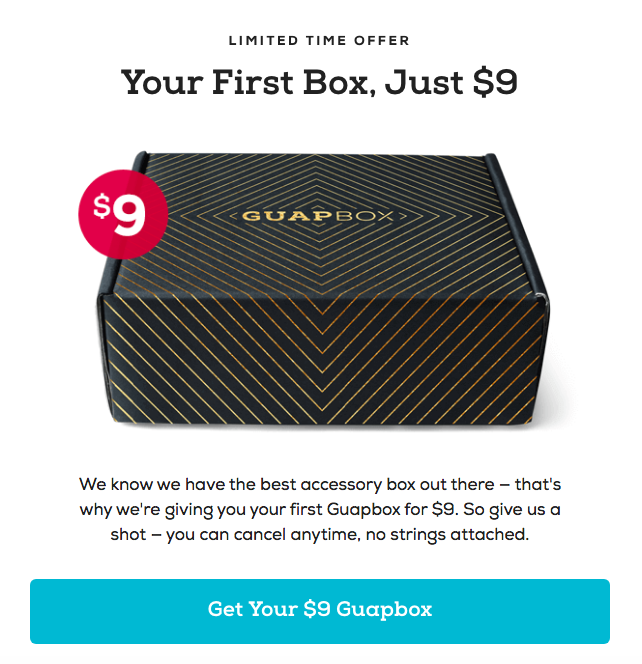 If the ad offers 20%, the landing page tells the clicker more about what you offer and then tells them how to redeem that offer. Landing pages are conversion tools. They give the clicker a straightforward next step that aligns with the ad. Congruency across your keywords, ads, and landing pages is your best friend. Here’s the landing page for the ad we showed a bit earlier. Notice how it sends you right to the oatmeal page, not just an overall products page. It’s more specific. Here’s another fantastic landing page from Ties.com. Click the ad that offers a $75 worth of ties for just $9. Go straight to this page that tells you how to redeem it. Now that’s seamless! This is PPC at its finest. Why settle for the average small business conversion rate? It’s about 3%-6%. You could be tripling it or more simply by aligning landing pages with your ads. While other PPC platforms have similar quality models, AdWords is the one where you really need to understand what your quality score is and how it impacts your PPC campaign success. Ignoring it will cost you a lot of money. In an effort to provide the best user experience, Google AdWords wants to show the most relevant ads to searchers. If they didn’t, they’d lose money because fewer people would click the ads. To accomplish this, they’ve established a system called “Quality Score”. It rewards businesses who provide an exceptional user experience. What Is Factored into a Quality Score? If people aren’t clicking, this tells AdWords that your ad is irrelevant. This might happen because you have poorly written copy. Or you may be appearing in searches that don’t really apply to your ad. To fix this, improve your ad copy or remove irrelevant keywords and locations from your ad. You may need to add negative keywords if they’re causing the irrelevance. If people leave your page immediately or don’t click on anything it’s a bad sign to AdWords. It tells them one of two things. Either people thought they were clicking on something else. Or your website provided a poor user experience. The page may take over 3 seconds to load. Or maybe it wasn’t mobile friendly. In either case, fix the experience to recover your score. AdWords wants you to fix the problem. That’s why they tell you what your score is. But if you ignore it, they will begin penalizing you by making you pay more for ad space. That’s as much as 400% more. But there’s a flip-side to this. Get your score up. That’s a 7 or higher. They will give you a discount on your cost per click and increase your visibility. This is just one more reason a successful PPC campaign isn’t a set it and forget task. If you’re running a PPC campaign, your ad should compel people to click. To do this, target someone specific. Once you’ve decided what characteristics to target, divide your ads up into ad groups. Each ad group will represent a specific target. You might further subdivide ad groups based on a specific service or product line. Align everything for a seamless experience for that target. So what should you be tracking while running a PPC campaign? Test your site’s speed and mobile-friendliness. You can use free tools from Google. Or you may choose to invest in real-time site monitoring. Not a day should go by that you aren’t very aware of how your website is treating people. If you make changes to the site, always test them. Make sure they display like you expect them to. Marketing Analytics company Kissmetrics performed an extensive study on how site speed impacts people leaving your site. 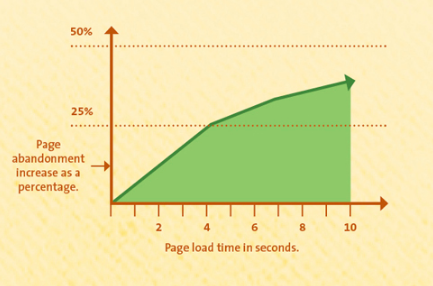 For every additional second your page takes to load, you lose about 10% of your visitors. If your page takes 5 seconds to load, that just won’t cut it. You’ve lost almost 50% of your visitors. But you paid for those clicks. Think mobile is an exception? Think again. Only 11% of mobile users said they accept that a site will load more slowly on mobile. If their phone can handle it, they expect you to deliver that speed. Over 50% of web traffic is now mobile. Your website should be responsive on all devices. You can’t earn clicks that convert if you’re not being seen. Keep track of your impressions. If it’s very low, reevaluate your bid caps and keywords to make sure you appear when you should and where you should. People should be clicking on your ad. If they aren’t then one or more of your keywords may be irrelevant. Or your copy isn’t compelling them to click. Make the adjustment to increase clicks. The average CTR across industries is around 3% for search ads and 0.46% for display ads. This excludes remarketing ads. These are the ads for your business that appear on another website after someone visited your site. These CTRs are much higher, but conversions are generally lower. As we discussed, you’ll pay more for clicks if you let your quality score drop. Compare the cost per click to your conversion rate and customer value to know you’re spending the right amount on each click. If it’s too high to give you a decent ROI, then increasing your conversion rate is your best move. In AdWords, the average cost per click is $2-$3 across all industries. But it can be significantly higher for more expensive services with highly competitive keywords such as legal, medical, and insurance. This tells you whether or not your ad is appearing in ideal spots. If it isn’t it may not be seen. You may need to work on your quality score or raise your bid for certain keywords. If you have a very low conversion rate, it makes your cost per click seem astronomical. But when you have the system in place to convert more clicks, cost per click becomes a very reasonable investment. To determine your ROI, spread the cost of clicks that didn’t convert across the ones that did. The average conversion rate in AdWords is 3.75%. It’s much higher in service industries. We’ve discussed this in detail so here we’ll just remind you to track it. With these strategies, you can run a more successful PPC campaign. Spend some time evaluating those keywords. Align your landing pages with the ads to get the best results. And don’t ignore your quality score. You’ll pay more. If you need help growing your business through digital marketing strategies that work, contact us today. Next Post Is an Instagram Pod the Latest Revelation in Advertising Your Business?